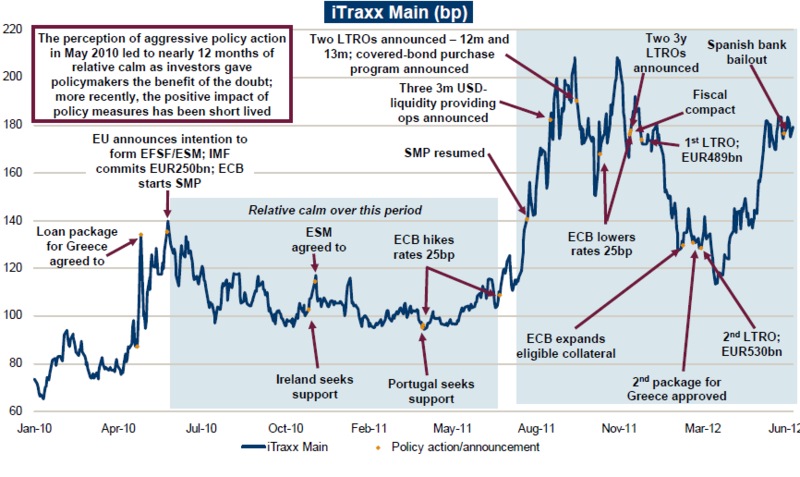 The historical chart from Barclays Capital below overlays the timeline of the various Eurozone policy actions on top of the iTraxx Main spread. It's a good chronology of policy announcements and market stress periods. 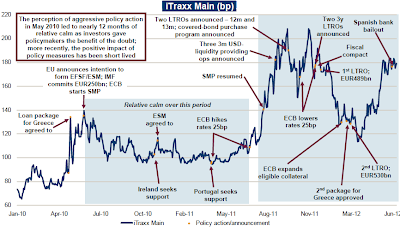 As a bit of background, iTraxx Main is a CDS index referencing 125 investment grade European corporations. It's quite liquid and tends to be a good representation of financial stress levels in Europe. The point Barclays is trying to make here is the declining level of confidence the markets now have in the policymakers' abilities to devise and implement effective lasting solutions. As many have pointed out, this lack of confidence has caused the time periods between each successive "positive" policy announcement and the next market "stress period" to become shorter.